South Korean actress and singer, Im Yoona (임윤아) walked the red carpet of the 2013 KBS Drama Awards held in Seoul, South Korea on December 31, 2013. 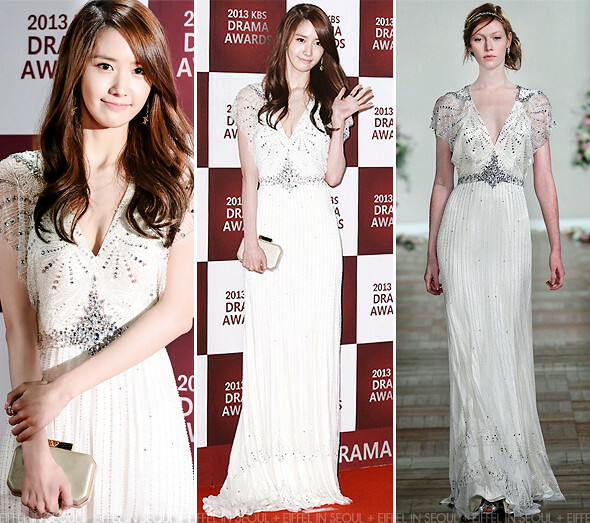 The 'Prime Minister & I' actress opted for the 'Nicole' embellished gown from Jenny Packham Bridal Spring 2014 collection. A gold Cartier clutch to complete her beautiful look. You may remember seeing a similar version of the dress on actress Lee Yeon Hee (이연희) previously.